For adventurers, intellectuals and artists, we have dormitory with lockers and Private Suites; Economic (with ceiling fan) and Special (AIR and TV), all accommodations come with ceiling fans, sheets, towels and room service included. Besides, of course, the full breakfast, with varieties of fruits, cold cuts like ham and cheese, breads and cake, jelly, juice, tea, coffee, milk and chocolate. ALL INCLUDED IN THE VALUE OF YOUR DAILY, WITHOUT SURPRISES AND WITHOUT EXTRA PRICES. COME AND SEE IT BY YOURSELF!! Our reception is bilingual and serves 24 HOURS. We also offer FREE broadband internet access throughout all the HC HOSTEL via Wi-Fi Wireless Internet and networked computers. TV room, with, dozens of DVDs and Play Station 2. Library and Discos. We have a reading and relax area with hammocks and rocking chairs for balance. 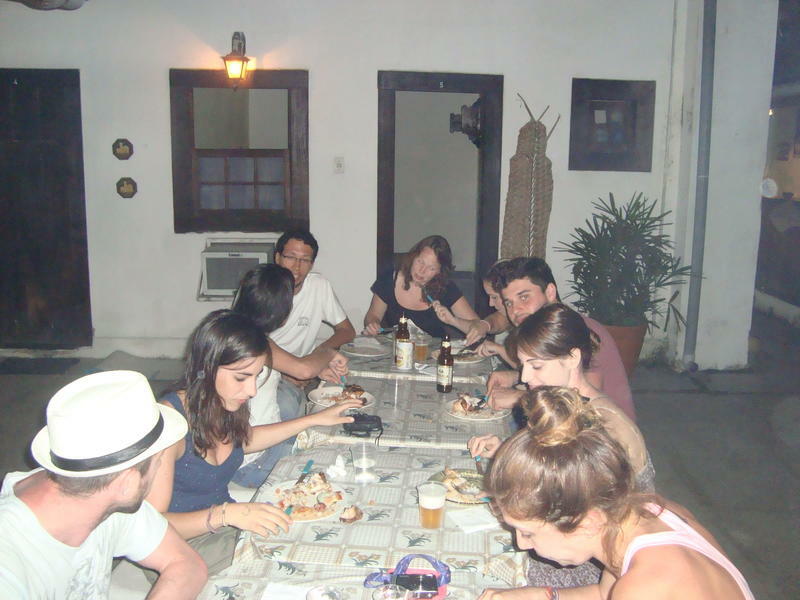 We have in the premises of HC Hostel, a bar, where you can taste excellent caipirinhas, Cachaas, beyond traditional local beers and soft drinks. The HC Hostel is the only one located in the Heart of the Historic Center. Live the magical experience of staying in comfort and tranquility in a place that mixes the essence of old with the new contemporary. We are next to the house of culture, where you can find the best cultural events of the city, and on the same street the theater, and the House of Music. 60 meters from the HC Hostel is the main tourist point Night Paraty, the Matrix Church, site of greatest concentration of people seeking to discover the charms of the Bohemian cuisine and Paraty. 150 meters left from the HC HOSTEL is located the most charming Postcard from Paraty, the Church of St. Rita of Cascia, and, very closer is the pier, the exit point of charming Schooners that take tourists to the most beautiful and and idyllic islands and beaches of Paraty. ONLY THE HISTORIC CENTRE HOSTEL-PARATY can offer you accommodation in this location and with the best conditions of comfort, accessibility and price. All this just 10 minutes walking from the PARATY bus station. Make your reservation and plan your arrival that we will drive to pick you up at the bus station, because, COMFORT, EXCELLENT CUSTOMER SERVICE AND QUALITY are our main goals and characteristics. In partnership with the best companies in Paraty, we offer great services, like transfers laundry, taxis, several tours as Schooners, Boats, Jeeps, Kayaks, Bicycles, Tree Climbing, Trekking and many others. BBQ, Self-service, with various accompaniments on Wednesdays and Sundays, FREE for bookings over 3 nights. And for that we wait for your visit, and consequently their critics and suggestions. Because changes and improvements do not stop there. Historic Centre Hostel is just 5 minutes walk from the bus terminal. Please contact us before you arrive so we know when you are coming.